Macron made the comments to his Cabinet Monday after the country faced its tenth day of grassroots activism against his green agenda. This weekend saw 100,000 ‘Yellow Vest’ protesters across the country with reports of violence and destruction of shop fronts and restaurants at the Champs-Elysées avenue, a tourist hot-spot, to which police responded by firing rubber bullets and tear gas. “One shouldn’t underestimate the shock to people, in France and abroad, of seeing in the media what looked like war scenes,” the progressive president is reported to have said, according to government spokesman Benjamin Griveaux. 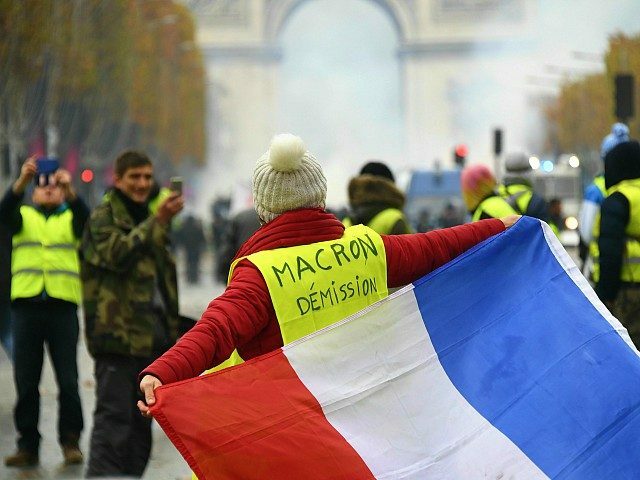 The action began as a populist-driven protest against diesel taxes, with protesters wearing the yellow vests which all French drivers must carry by law, but evolved to include protest against other policies, with protesters calling Macron the “president of the rich” who has abandoned Frenchmen in rural and suburban areas. After Macron scolded protesters last week, his government has laid full blame for violent incidents on “the brown plague” — an allusion to paramilitary Nazi Brown Shirts — with his government suggesting those bearing banners of the populist, anti-mass migration National Rally (formerly the Front National) were responsible. “Certain people wearing yellow vests were going up the Champs Élysées with flags that said ‘We are at home’ [a common National Rally slogan]. They belong to the very identitarian extreme right. And those people, we will fight them every minute, every hour, every day of Mr Macron’s term of office,” Mr Griveaux said Monday. The Yellow Vests have appointed a delegation and want to meet with Macron and Prime Minister Edouard Philippe to review the decrease of green fuel tax and to create a “citizen assembly” to debate legislation related to France’s environmental policies, according to euronews. Macron gave a speech addressing the unrest and outline his energy strategy on Tuesday, where he stood by his green policies and further tax increases planned for January first, in his bid to ban the sale of petrol (gas) and diesel cars by 2040.